In this post, we’ll discuss the first set of fundamental filter settings which are indicated in yellow in the image above. Dividend is the portion of the final profit paid to the shareholders. But what gross return is achieved with the dividend? The dividend yield is calculated by dividing the total annual dividend by the current share price. 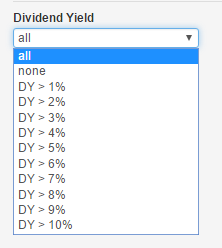 For example, if you only want shares with a dividend yield greater than 4%, you can use this filter. The payment of a dividend is just one thing. Yet, there is another important dividend filter which you should definitely keep in mind. The dividend growth filter tells you exactly how much the dividend yield has risen over the last 5 years. High dividend shares will be less likely to increase their dividend than shares that start with a lower dividend policy but consistently increase their dividend yield year after year. An example: you buy a share of 20 dollars and receive a dividend yield of 5%, which amounts to 1 dollar. Suppose the return over the next five years has increased by 20%, giving you 1,20 instead of 1 dollar. This means an increase of the dividend of 6% compared to your original purchase price. Suppose you make the same investment in another 20 dollar share but you initially received 4 instead of 5% dividend (0.8 dollar). However, the dividend yield in this share has risen by 75% after five years. This means that your dividend has risen to 1.4 dollars and the dividend yield at the original purchase price is no longer 5% but 7%. How much of the net profit does the company distribute to the shareholders? To find out, the payout filter was included. The payout is calculated by dividing the dividend by the net profit of the company (after taxes). The result is then multiplied by 100% to calculate the ratio. New companies generally know a low payout ratio because a large part of the profit is reinvested (with the intention of realizing / financing further growth). Large-scale companies, where the further opportunities for growth are a lot smaller, usually outweigh a greater part of the profit in the form of a dividend, and will also do every effort to keep the dividend as stable as possible. The price-earnings ratio says something about the valuation of the company and its profit forecast. In order to calculate a price-to-earnings ratio, the company must make a profit. The calculation is simple, the share price is divided by earnings per share. In general, the higher the price-to-earnings ratio, the more expensive the company is considered (appreciation). A low p/e is an indication that a company is undervalued, while a high p/e points in the direction of an overvaluation. Yet this is a (too) gross generalization. A high p/e can also be interpreted as if a company expects a larger increase in profits in the future while at a low p/e a decrease of the same profits will occur (profits forecast). 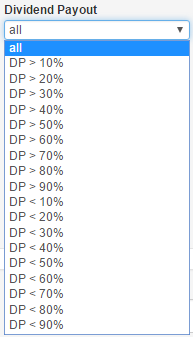 The table below can be used as a guideline in interpreting these ratios. 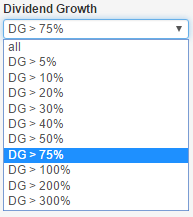 However, keep in mind that these are only average guiding values! Comparing price / earnings ratios is only useful between companies that are part of the same sector. Indeed, certain sectors are characterized by low p/e while other sectors have higher p/e. The only difference with the explanation above about the normal price-to-earnings ratio is the way in which it is calculated. For the normal p/e, the share price is divided by the known earnings per share. However, for the calculation of the future p/e, analysts use a future ‘earnings per share’ based on an estimate of the ‘expected profit’. This calculation may be more up-to-date, but of course with less certainty (estimates may differ a lot). This ratio is a combination of the previously mentioned price/earnings ratio but adds a further factor, which is the expected future growth. The ratio thus consists of three combined elements. The PEG ratio itself can be calculated by dividing the p/e by the percentage of expected growth. 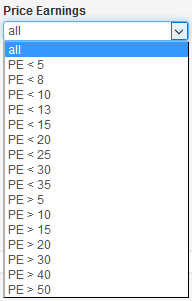 ​​In the screener itself there are two ways to calculate the PEG-ratio. 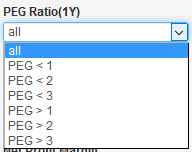 You can filter on the PEG-ratio, which calculates the growth factor based on the estimated profit for the coming year. Or you can use the PEG-ratio, which calculates the growth expectancy based on the profit achieved over the last 5 years (average). The value obtained is the so-called PEG-ratio. Company A has a price/earnings ratio of 16 and a predicted annual growth rate of 20%. Company B has a p/e ratio of 12 and a projected annual growth rate of 12%. Based solely on the p/e data, company B seems to be a more interesting option considering the lower p/e. However, if we calculate the PEG-ratio for both companies, the conclusion is different. For company A this is 16/20 (p/e divided by annual expected growth) = 0.8. For company B we will get 1 (12/12). If we compare these figures with the table above, it seems that company B is indeed valued correctly (PEG-ratio of 1) but company A – despite its significantly higher p/e – with a PEG- ratio of 0.8 is a better choice. In the next article (see this link) we will continue with the explanation of the other fundamental filters.